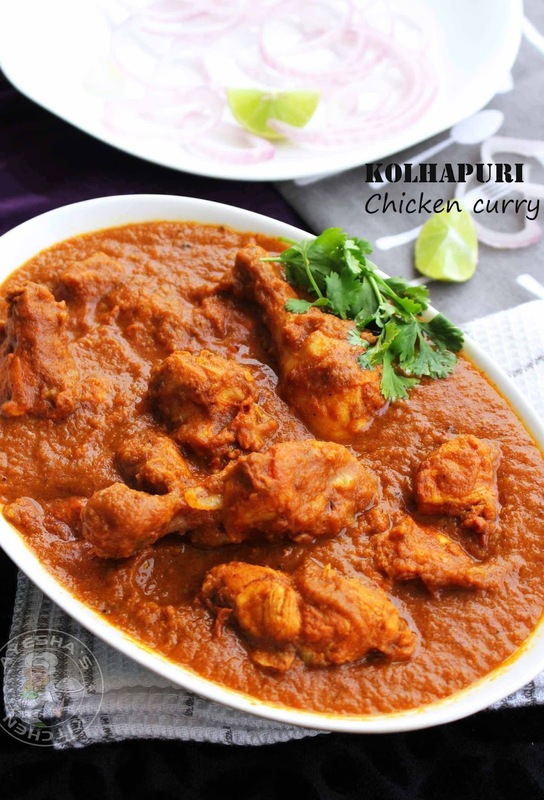 Kolhapuri chicken curry is a spicy aromatic chicken curry recipe where chicken is cooked in a flavorful thick spiced gravy until soft and tender. Kolhapuri masala uses those spices which is used in the preparation of indian curry recipes. 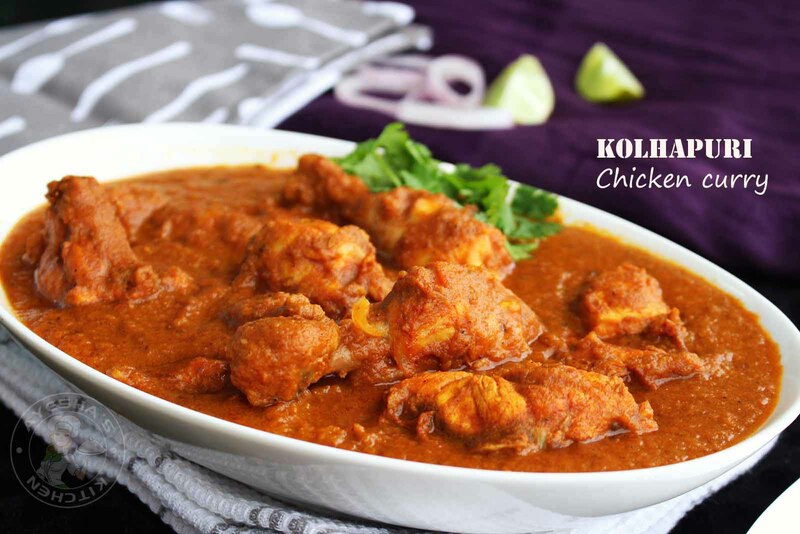 This chicken dish is from the city of Kolhapur in Maharashtra. Trust me, this chicken dish will never let you down. Each and every chicken recipes that i try in my kitchen gives a feel of excitement. This chicken curry is an ultimate crowd pleaser. 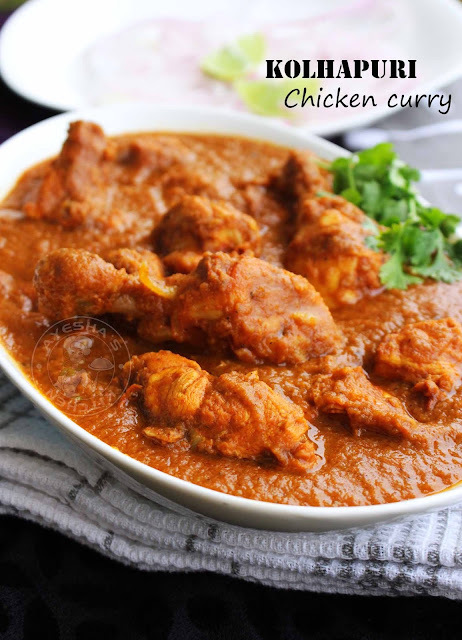 Hope you all love this best chicken curry recipe. Make medium-sized chicken pieces and wash them thoroughly. Drain the excess water and set aside. Make tomato puree by adding two ripe tomatoes chopped in a grinder and then grind it until a smooth paste. (do not add water). Meanwhile we can start preparing the gravy. For that, heat a nonstick wok with oil ( 3 tbsp or more). First we can saute the ingredients mentioned under ' to saute and grind'. Add pepper corns, bay leaf, garlic, coriander seeds, cloves, green cardamom, cumin seeds, sesame seeds and toss it for a while. Then add the sliced onion and saute until slight golden. When done, transfer it to a plate and let it set aside to cool. Once cooled, grind it to a smooth paste without adding water. Heat a separate non stick frying pan with 1 tbsp of oil. Shallow fry the marinated chicken both sides for 5 minutes. Now add the shallow fried chicken pieces to this prepared onion tomato gravy. Combine very well and cook it covered until chicken is well coated in the gravy or until 20 minutes over a medium low flame. When done serve hot along with chapati, paratha or ghee rice. Irresistible dish.